What I had hoped would be a quick order and a big step forward on the project is dragging out indefinitely it seems. The company in the UK I was going to order the new chassis, frame, and suspension from is dragging things out because of the chassis. 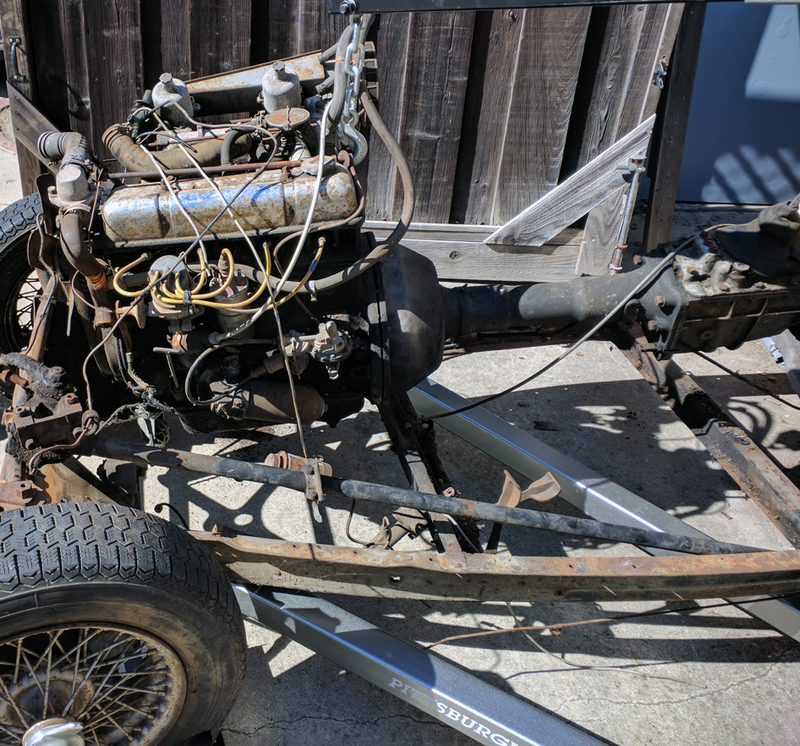 I’ve lost count of how many emails I’ve sent back and forth to both them and the chassis manufacturer trying to get through to them that I do not want a custom chassis, but they’re all hung up on the fact that I am going to be putting the Solstice engine and transmission into the vehicle. 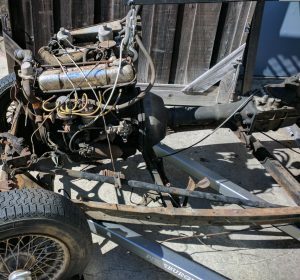 I’ve told them, repeatedly, that I am not asking them to either modify the chassis or even worry about what I may or may not have to do to get the Ecotec installed, but that does not seem to be sinking in. It’s honestly rather frustrating. 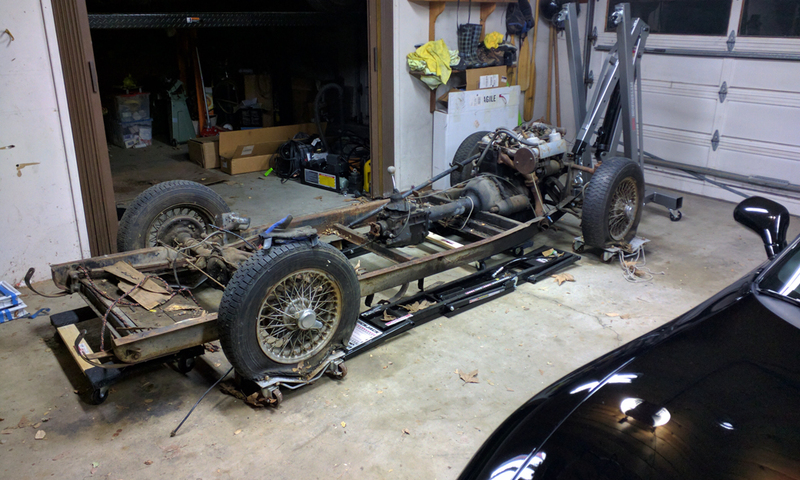 I do have other places I could go, but going through this vendor is going to be the best option as they are located close to the suspension, chassis, and frame manufacturers, and in particular the frame manufacturer has been highly regarded by other Morgan owners. Barring any unexpected financial issues or such calamities, if this hasn’t moved forward by roughly the end of January, I’m thinking I’m going to have to come on a little stronger and tell them to either move forward with the order or I’ll go elsewhere. So, some interesting progress this weekend. I was recently introduced to John Buddenbaum, or possibly re-introduced as I believe we’d met previously, owner of Buddenbaum Fabrication in San Carlos. He’s an interesting individual to say the least, and by interesting I mean his garage / fab shop is something most car guys dream of. He’s also had some Bonneville experience, and in fact the reason I was able to meet with him on my busy schedule was he was in the shop taking the fire suppression system from that vehicle and putting it in his Morgan for track use. Anyways, I visited him as it had been suggested he could possibly repair the front wing (fender) damage my original wings had taken, and for a good bit less than the ~$1k / each price I was looking at for a new pair. So taking those nearly 7 foot long fenders in our Avalanche, the only vehicle they’ll fit in, up to his shop for review, we determined he could get the repairs done. 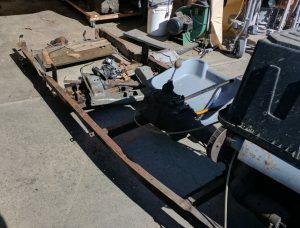 While chatting with him about my project, it occurred to me that even though I’m ordering a new chassis, in the mean time I can use the existing chassis to begin mock-up for the Solstice motor and transmission mounts. I will have to ask John the next time I’m at his shop if he would mind letting me take some photos to share with you folks. Last Saturday was over 100° F outside, fortunately I spent the day in Monterey playing airsoft not far from the ocean, so I only experienced high 70’s. That Sunday (the 24th) however, was in the high 80’s, and I spent wrenching on the Morgan. I was pleasantly surprised to find all the bolts for the rear suspension mounts to be almost able to be turned by hand. Contrary to my experiences with the Barracuda, nothing has seized up over the years. 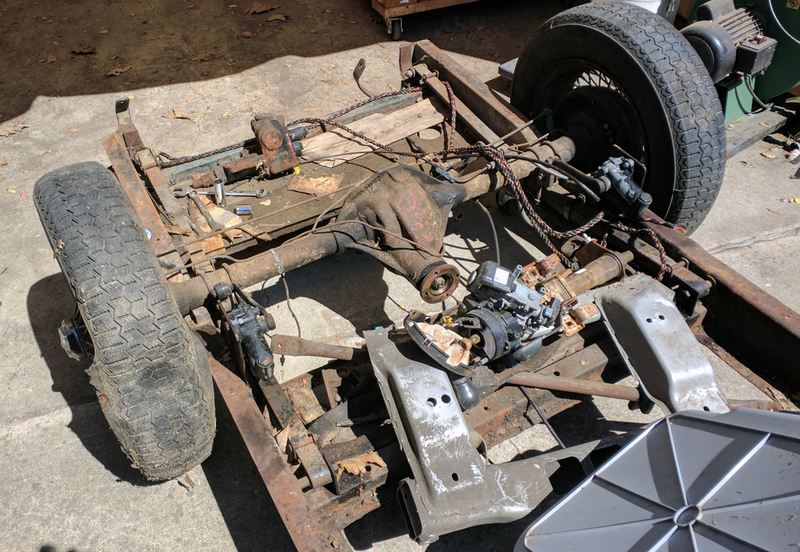 My father attributes this to the fact that “all English cars are self-lubricated during operation.” I got the rear axle, leaf springs, and rebound spring assemblies off the chassis, and stored them back in the tent. It was late enough at that point that I called it quits. This weekend, it was in the high 80’s to 90’s on Saturday, so again I decided it’d be good to work on the Mog. I, by my father’s suggestion, unbolted the bell housing from the back of the engine, and that proved to be a mistake. 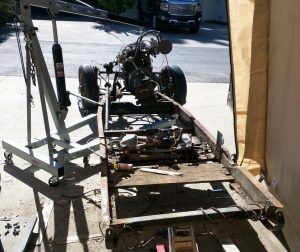 When I went to try and lift the engine, the bell hosing and transmission were too heavy to lift free. So, I just kept lifting the engine. The engine mount rubber was so dry and rotted that they just fell apart (unnerving, as that was all that had been holding the engine in place for several months). Then, my troubles started. 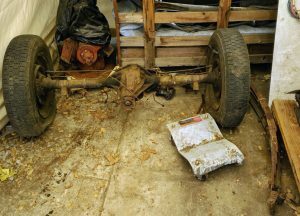 I had a metal cart that I was going to lower and strap down the engine to, and one of the wheels collapsed… which caused the engine, transmission still attached, to topple over. This resulted in breaking the distributor and spilling a good deal of oil out the oil fill cap (that I spent Sunday cleaning up). After much pulling and cursing, I wrenched free the transmission, put that on a separate wooden cart, and then kludged together a setup to hold the engine upright on a wooden cart with a large plastic tub strapped to it. I unfortunately do not have any photos of the chassis with the engine out, I was too wiped out and dinner was getting cold when I rolled all that back into the tent. I was considering trying to get the remainder of the front end off the chassis this Sunday, but between the heat, being sore as all hell (I’m all kinds of broken as of late), and one of my puppies hurting their leg and needing attention, I spent Sunday just relaxing and recouping. Might spend some of the Fourth on the car if it’s not too hot out. Oh, also, I’ve been restoring a Boyle-Dayton gas pump that I acquired from my neighbors. It’s back together enough that we’ve got it in a temporary spot out front of the garage until we make a more permanent fixture to mount it on. 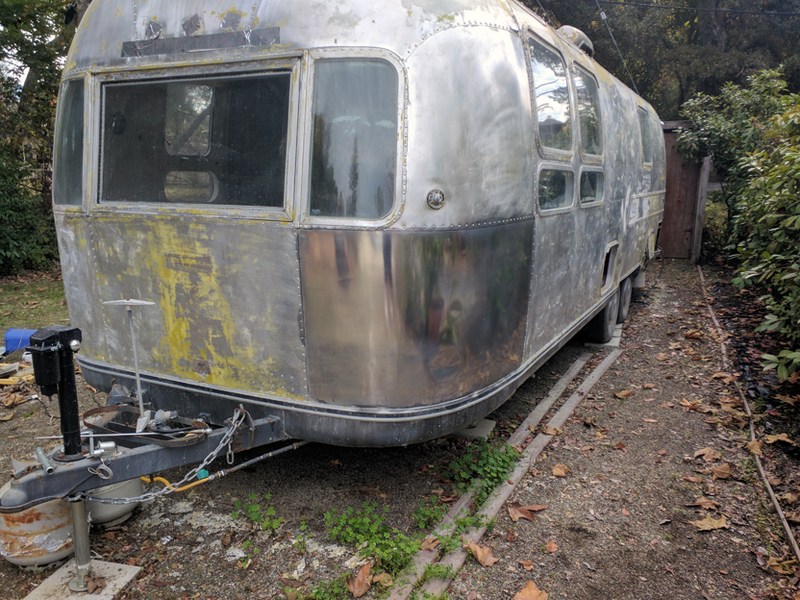 Also-also, the Airstream – coworkers have helped remove all the exterior paint, and while attempts to polish have failed, we did get the whole exterior sanded to a uniform finish with some ~350 grit sandpaper. Currently looking into ways to get a proper polish on it, and will return to fixing up the interior again soon. I’ll start with the broken record: work’s been busy, plenty of other around-the-house projects keeping me busy, and despite months of therapy and a cortisone shot right into my shoulder, my right shoulder still has limited range and plenty of pain. I have a couple of quick photos. 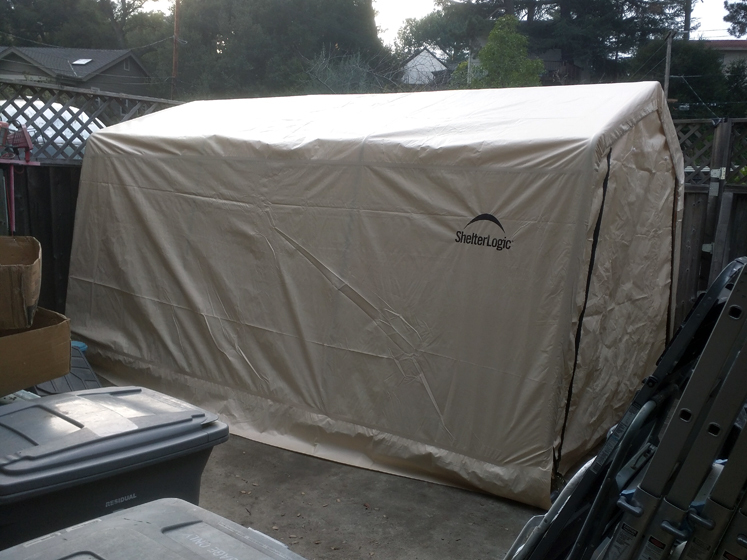 I built a temporary garage last weekend to house the Morgan and all its parts. I still need to finish pulling the frame apart, but at least this way everything will be kept out of the elements. Additionally, a few weeks back I did a test case of polishing a panel on the Airstream, and for the quick ten minute polish and clean the results are both promising and encouraging. 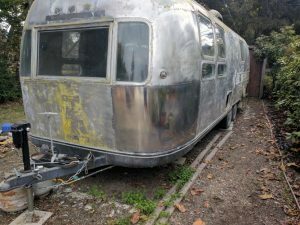 Going forward, working on the Airstream may be a higher priority, as it is my hope to have it ready to sell by this coming summer. 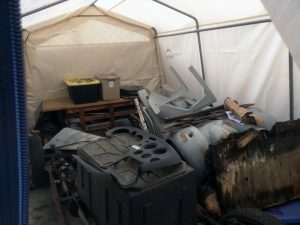 The money made off the trailer will help fund the more costly items for the Morgan, like bodywork and final paint. Additionally, there may be another vehicular addition to the family in the near future if things work out. Fingers crossed, and I’ll keep you guys updated.